It’s finally happening. We’re going home to New England, an 8,000-mile journey, on Horizon, our new Atlantic 48 catamaran. We are leaving tomorrow, Monday, April 20, 2009. 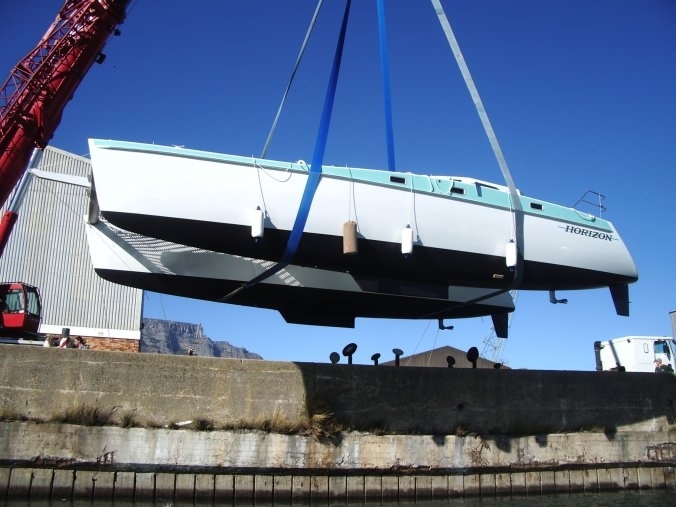 We’ve been in Cape Town since October 27, 2008, getting Horizon ready for sea. 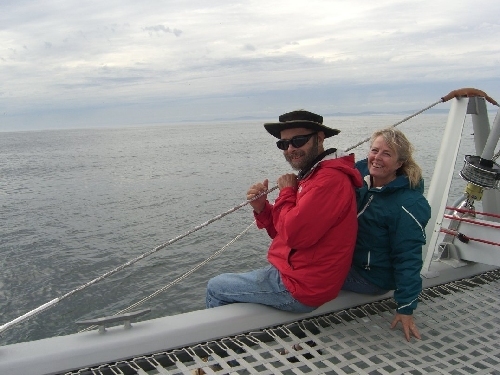 Here we are on one of the sea trials, just outside the Cape Town Harbor, several weeks before we left on our journey. When you sail from one harbor to another, the first harbor is really important – because all of the subsequent officials base their decisions on the first place you left. In preparation for our departure, we went to customs last Friday, where we waited in line for 55 minutes, only to be told we had to go to Immigration first. So, we went to Immigration, only to be told by a woman who is legendary for her rudeness that we had to check out within 24 hours of the time we were actually leaving. Sigh. 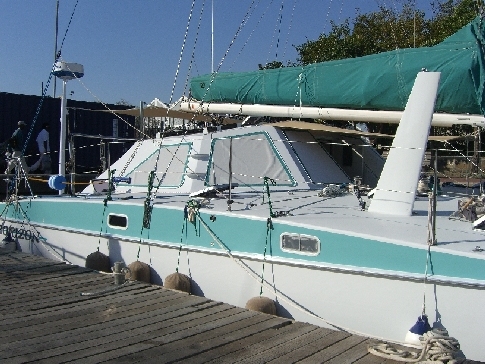 We went back to the boat, filled out the forms she gave us, and waited until Sunday. It’s Sunday evening. We went back to customs and immigration this afternoon. The was plenty of parking, there was no waiting in line, and no one in the offices except us and each officer. One nice man in Immigration, stamp-stamp-stamp. Another nice man in Customs, stamp-stamp-stamp. Both the Immigration and the Customs man rolled their eyes when we mentioned that we had to return because of the 24-hour rule. Apparently no one else holds sailors to it; anyone else would have just stamped our forms. Oh, well. All’s well that ends well. Our papers are all in order now. 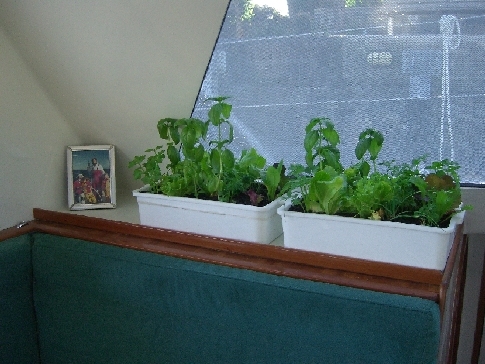 The boat is filled with food, and we have storage room left over. That’s good. Philip filled the diesel tanks today, and I’ll fill the starboard water tank tomorrow so we leave with full water tanks. But let’s go back a bit to the beginning of the story. When we first came to South Africa to “pick her up and sail her home,” we stayed in Gordon’s Bay, high on the windy hill in a rented house. It was so lovely there. The house was situated just to the right of the “GB” on the hillside. The Dutch-inspired architecture on the houses just below us. 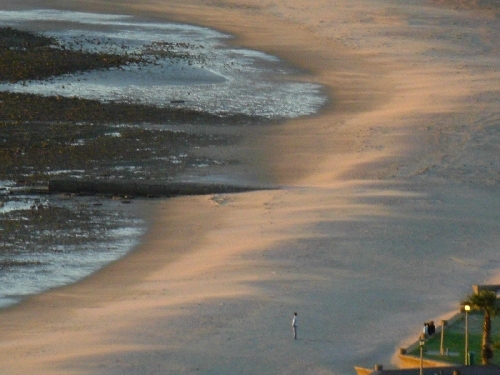 The wind-swept surf at Gordon’s Bay beach. 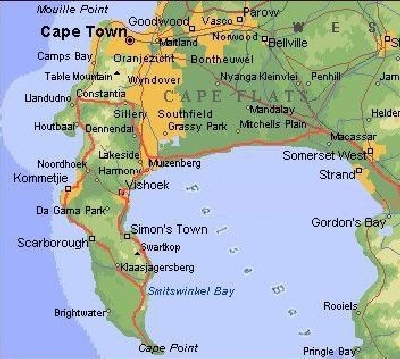 As you can see, Cape Town is actually on the top of a peninsula. 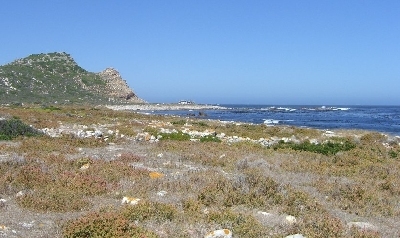 Cape Point is at the southern end of the peninsula, and Gordon’s Bay is across False Bay. They call it False Bay because sailors coming around the bottom of Africa went into it, thinking they were going north up the coastline of Africa. False. It’s a very shallow bay, and very windy. So there are a lot of wrecks in False Bay. 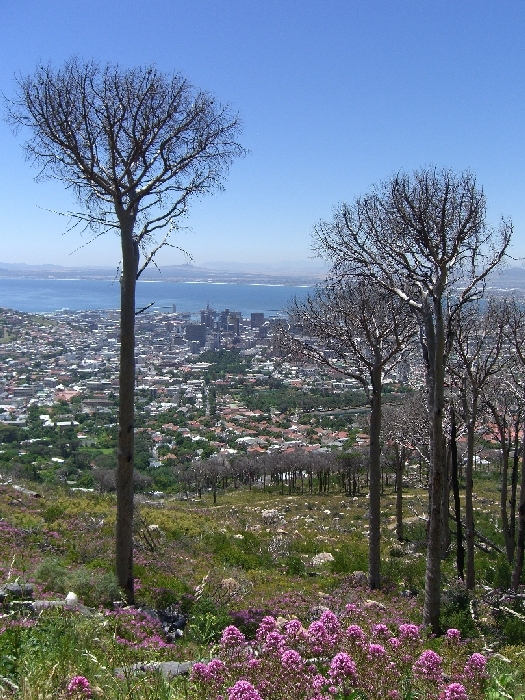 Here’s a bird’s-eye view of that same peninsula, this time looking south from Cape Town. 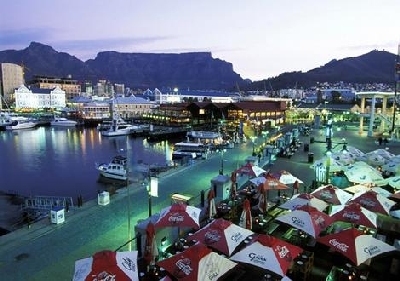 When there is a “tablecloth” on top of Table Mountain, the wind HOWLS down into Cape Town and the Cape Town Harbor. 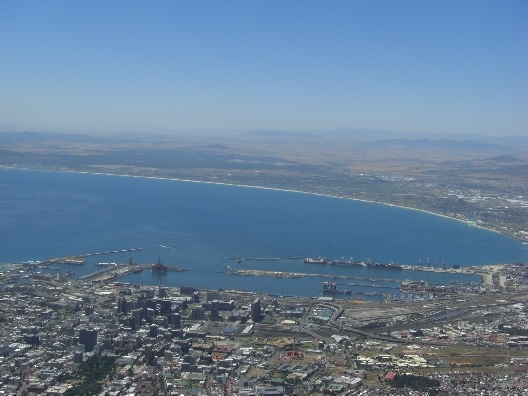 In this shot you can see Elliot Basin, the larger rectangular harbor in the lower left, and the V&A Waterfront area, which is the smaller rectangle in the lower left. We stayed in both marinas while we were in South Africa. Moving right, at the bottom of the shot, you can see the new stadium they’re building for the 2010 Olympics. 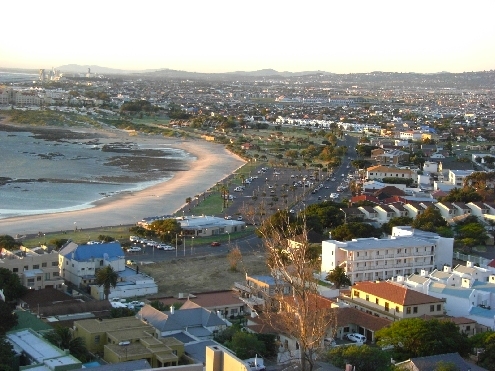 And moving around Table Mountain, a beautiful seafront area called Green Point. 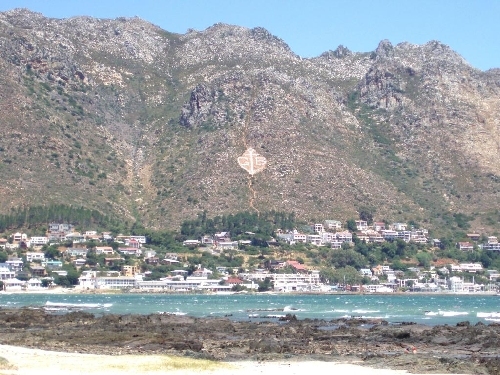 In the top right corner, you are actually looking south to the Cape of Good Hope. We were in South Africa for months, but we were so busy we only went sight-seeing a couple of times. Once to Cape Point and Cape of Good Hope, and once to the top of Table Mountain. 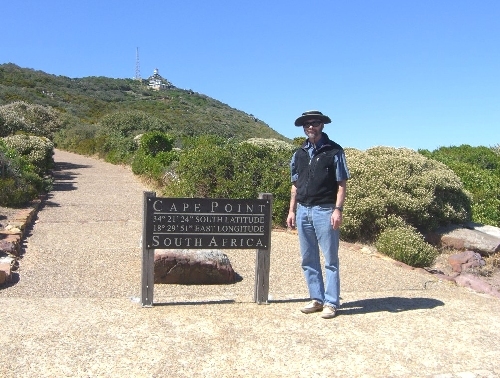 Here’s Philip at the start of the walk up to Cape Point. 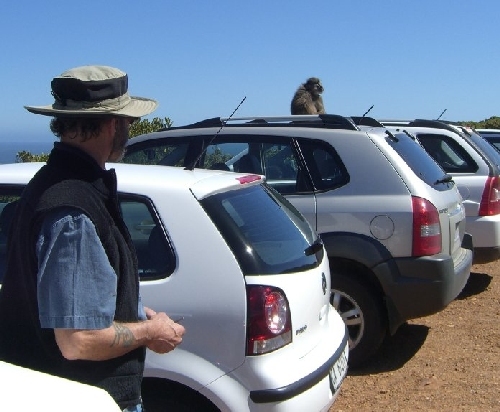 Philip having a little chat with one of the many baboons in the Cape Point parking area along the road. Here’s the Cape of Good Hope, which is just a bit further north up the peninsula from Cape Point. 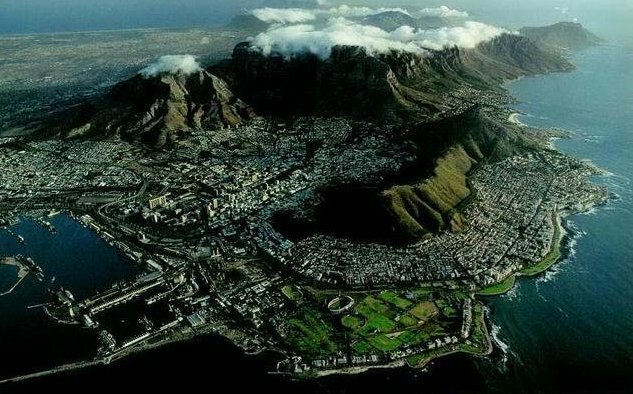 This is a picture we took of Cape Town from the top of Table Mountain. And another, showing some of the local fauna. Many of the plants in Southern California came from South Africa, so much of the plant life was familiar. Southern California is about as far north from the equator as South Africa is south of it; growing conditions are similar. 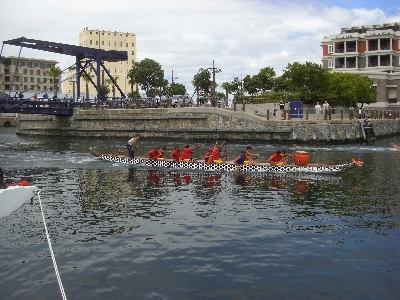 We were often entertained by the “dragon boat races” they had there, almost every weekend. There’s a lot of shouting associated with this sport, to keep the rowers in rhythm, and the competition is fierce. While we were there, there were a number of fires during the hot summer season. This one was particularly dramatic, burning the dry grass along the side of Table Mountain. For weeks afterwards, there were ashes on the boat every morning, as the strong winds blew them down from the mountain side. 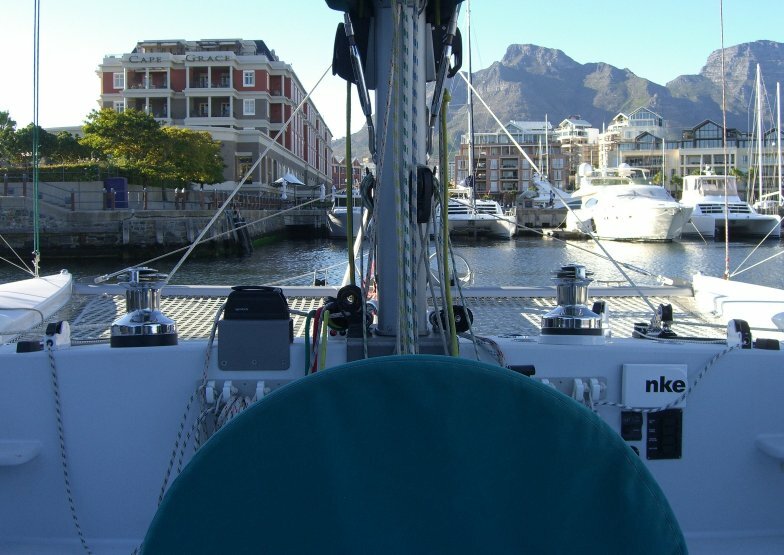 Here’s an early morning shot, taken from Horizon’s cockpit in her berth at the V&A Waterfront. 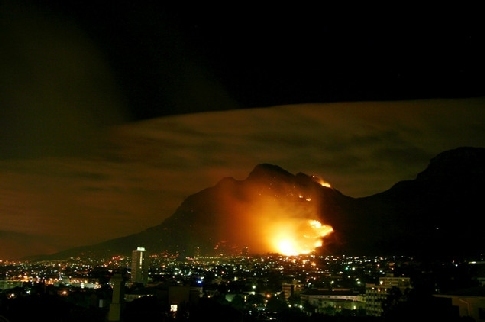 We’re facing the part of the mountain that was burning in the fire picture. 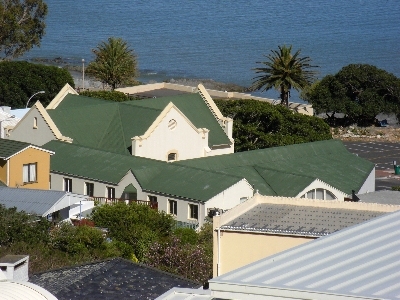 The Cape Grace hotel is on the left. 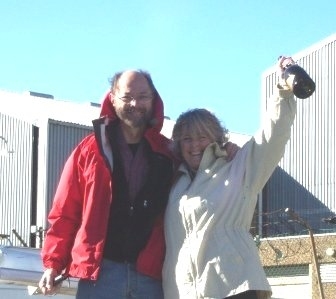 We launched the boat in November, 2008, in Elliot Basin. Here are some shots from that happy day. Here she is, being lifted over the sea wall and into the water at Elliot Basin. And here we are, just after she was floating for the first time – when a boat truly becomes “alive.” Obviously, we are thrilled. This moment was a long time in the making. 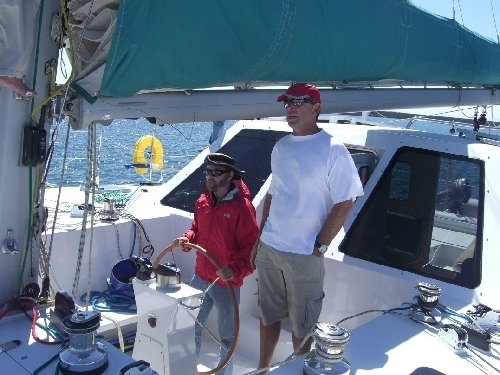 Matthew Thomas, on the right, stands in the cockpit of Horizon as Philip steers the boat back into the V&A Waterfront marina after a sea trial. Matthew’s help was invaluable as we readied Horizon for our 8,000-mile voyage. He’s a systems engineer with more than 100,000 of sea voyage experience, a wonderful person and a great cook. 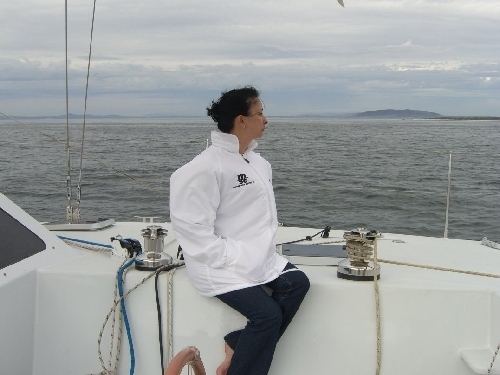 Matthew’s better half, Ally, takes in the view on a beautiful day just outside Cape Town Harbor. 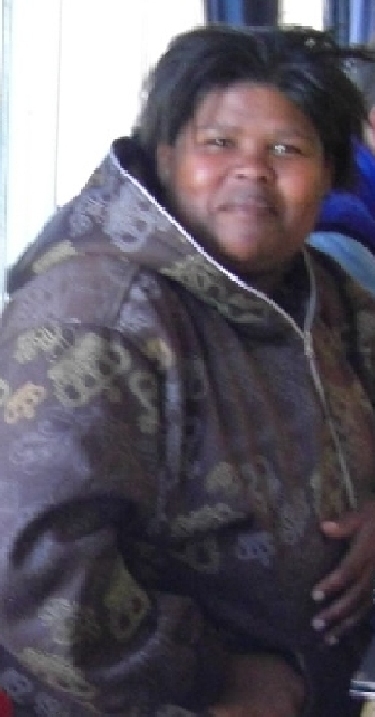 Allison was the office manager at the boat builder’s and we became very close friends. 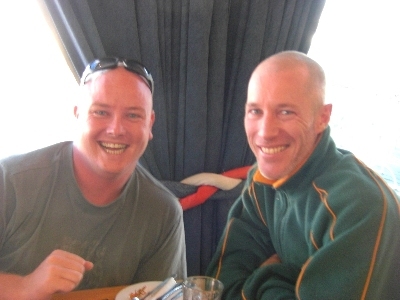 This picture was taken at the post-launch breakfast, at the Royal Cape Yacht Club. Same breakfast, this time it’s Lutz, who drove us around and was tremendously helpful the first few months we were in South Africa, and Jean, who did so much of the work on Horizon. 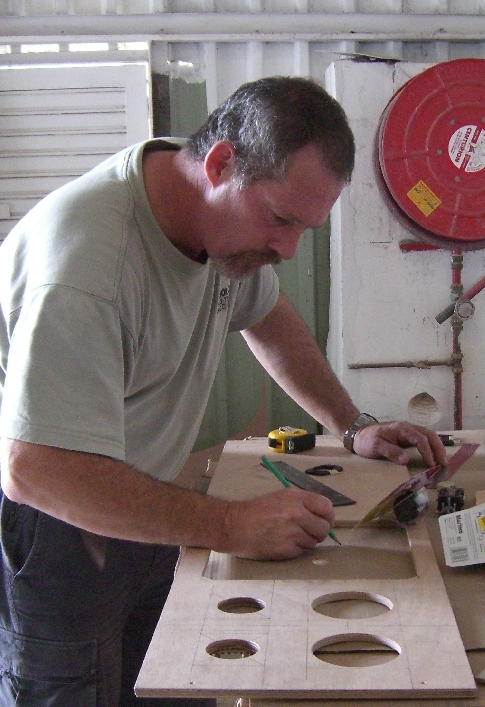 And here’s Dr. Phil, hard at work, at the boat builder’s shop. He did almost all of the carpentry on Horizon, and kept us in stitches with his tales. Here’s Horizon, at the V&A Waterfront, almost ready to go. 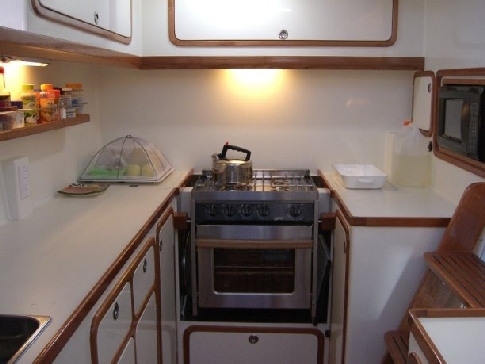 Cooking on Horizon is a dream, partly because catamarans sail “on the level” and partly because the galley is so spacious and well-laid-out. Dr. Phil gave us a classic tea kettle before we left, which I used often to make Rooibos tea. 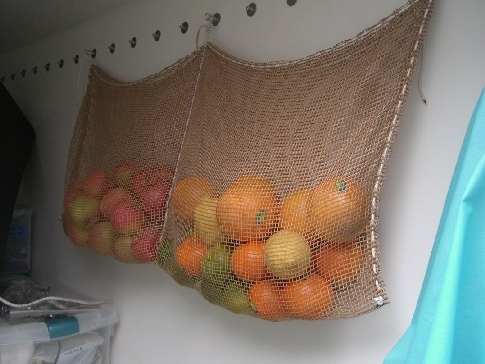 Here are the food nets Philip made, hanging from the special “ring” nuts that we had made for the purpose. There was more than enough storage room on Horizon, even for a 2-month trip, but this was a good way to store produce so it was ventilated and protected. The row of nuts are what hold the trampoline track in place. Matthew and Ally have been so kind. This is a “halfway box” that we will open when we are “half way.” The four little faces are their three cats and one dog (a goofy, wonderful cocker spaniel who thinks he’s a cat), and includes “Mac,” who is a tiny black cat who is absolutely fearless. When we leave tomorrow, we will have strong winds taking us out to sea, as this forecast shows (click to enlarge). Down in the Cape Town area, we will have winds in the 24 – 28 knot range indicated by the orange area. The direction is perfect; the wind will basically be lowing us right where we want to go. Once we leave the coast of Africa, about 3 days out, the seas will settle and the wind will be more in the 14 – 20 range, which is great. St Helena is the tiny black dot just below the “N” on the word “Ocean” – we may stop there – depends on the wind. You can just see the eastern tip of South America on the left side; that’s where the doldrums will probably be. And so, finally, the journey begins. The boat is truly ready, all systems are “go.” We have learned many things, and have met some wonderful people. But we are really glad to be going home.